Cervantes is present onstage as a character with a dual function. One is the role of the author who delimits, explains, adds “footnotes”, slows down or speeds up the action, creates jumps in the timeline and spaces between scenes. This is the author as demiurge, as we witness him creating his immortal novel live on stage. On the other hand, we also see his life journey, we glimpse the man himself, his worries, his memories, his problems, his “identity crisis” (so clearly reflected in his fictitious knight) and his disillusionment as a veteran of a lost war, as a humanist, as a soldier, as a dramatist, as a traveller. As a compendium and symbol of the afflictions suffered by a Spain defined by culture and humanism, Cervantes himself is more than a touch Quixotic, emblematic of a whole era. 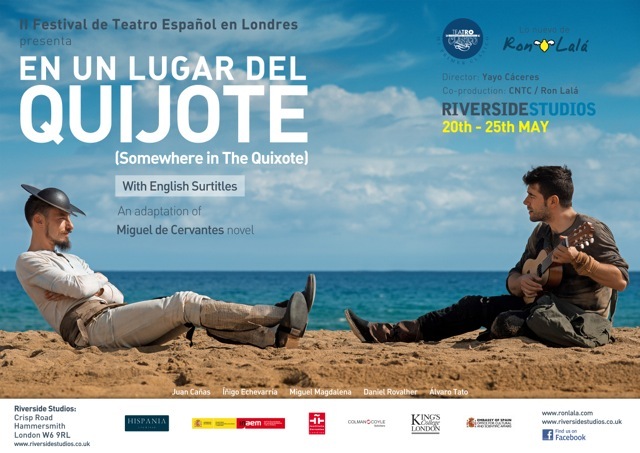 This duplication of planes (the Don Quixote plane and the Cervantes plane) is expressed to the full on stage with juxtapositions, games, interaction with the audience, live music in various styles and the company’s distinctive trademark: a sense of humour which is subtle, ironic and critical, and which on this occasion is given a Cervantine twist in order to give the wider public access to the absolute universal classic of our culture. It is an uninhibited modern take, on a perennial legend, with live music and a sort of “open” performance which is lively, burlesque and dynamic, refined and populist at the same time. A show in which the funniest moments and cleverest dialogues of the novel are portrayed at a headlong pace, together with Cervantine observations and a fistful of hilarious songs. A formal, scenic, textual and musical play on the traditional and the modern, combined to produce an intelligent chuckle. A spectacle which makes us learn, laugh, participate and, above all, relive the legend of Don Quixote recreated in the present day.